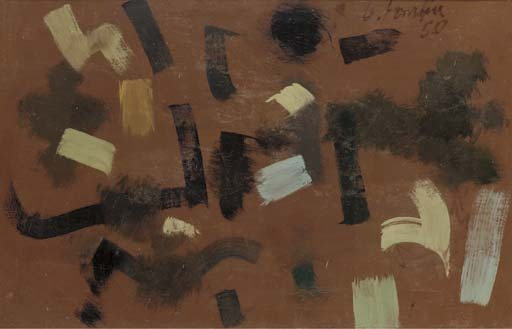 (possibly) Washington, D.C., The Phillips Collection, Exhibition of Paintings by Bradley Tomlin and Other Abstract Expressionists from the Collection, March 1955. New York, Whitney Museum of American Art; Raleigh, North Carolina Museum of Art; Colorado Springs Fine Arts Center; Los Angeles, Art Galleries of the University of California; Pasadena Art Museum; San Francisco Museum of Art and Utica, Munson-Williams-Proctor Institute, Bradley Walker Tomlin, 1957, pp. 45 and 59, no. 31 (illustrated). Hempstead, Hofstra University, The Emily Lowe Gallery; Buffalo, Albright-Knox Art Gallery; Utica, Munson-Williams-Proctor Institute; Lincoln, University of Nebraska, Sheldon Memorial Art Gallery and Berkeley, University of California, University Art Museum, Bradley Walker Tomlin A Retrospective View, April 1975-May 1976, pp. 48-49 and 122, no. 60 (illustrated).